If you’re like most people today, organizing your space is crucial to the success of your household and family needs. Being organized leads to a positive environment and allows you more time to concentrate on the important things in life. 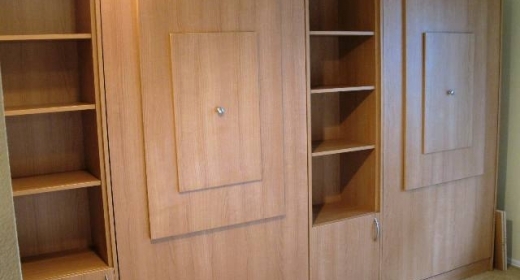 Now is an excellent time to address your space needs with a Murphy WallBed by Northwest Closets & Wallbeds. Yes, we said “Murphy Bed” also known as a WallBed or Wall Bed. They’re back and more popular than ever. Gone are the days of Laurel and Hardy where the beds were portrayed as a fold away trap for your worst enemies. These days the beds are sleek, reliable and built for comfort. Whether you’re renovating, re-organizing or downsizing, a Murphy WallBed can provide a unique solution for your storage needs. During the day a room can function as a TV room, home office, playroom, craft room, sewing room or whatever you require. Simply and quickly the room can be converted into a guest room. A standard 12" mattress creates a comfortable night sleep for you or your guests and is easily tucked away into a 16” depth bed cabinet when not in use. The Murphy Bed Hardware used in today’s wallbed is state of the art. It’s a counter-balanced spring system with a lightweight frame which results in finger-tip operation. Whether you’re six or eighty-six you’re able to open and close the bed with ease and rest comfortably knowing your new Murphy Wallbed comes with a lifetime warranty. In addition to the Murphy Bed itself, other furniture pieces can also be designed to function with the bed. For instance, matching side cabinets with wardrobes, drawers, and slide-out night tables allow for storage on either side of the Murphy Bed or a corner desk with overhead cabinetry can be utilized for a home office. 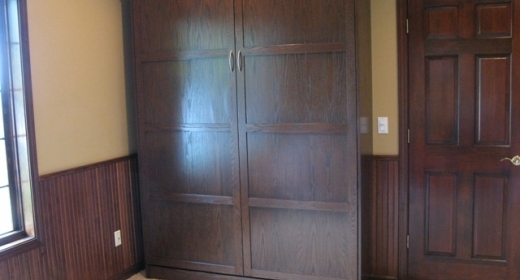 The Murphy Bed systems can be custom designed to best fit your space and budget. Smaller spaces have a higher demand for storage solutions. WallBed Seattle has been manufacturing Murphy Wallbeds and home offices for 15 year through out the Pacific Northwest Oregon and California. using innovative technology and beautifully designed cabinetry. A well executed storage system can transcend form and function into architecture for the art of living better, giving you more room in your life for the things that matter most.